The Summer School will take place on the main campus of Warwick University. Note that the nearest train station to campus is Coventry station, not Warwick train station. Information on visiting the University of Warwick can be found here, including travel directions and campus maps. 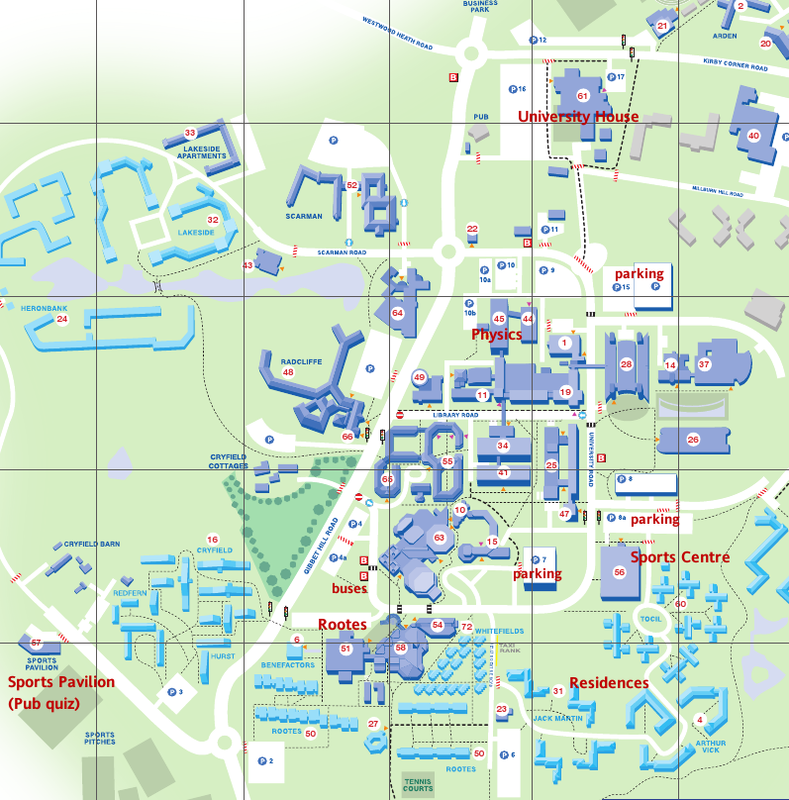 Click on the image on the left for an annotated map of central campus with the key buildings marked. The lectures will take in the Physics Lecture Theatre located within the main Physics building (building #45 on the campus maps) which is part of the Faculty of Science. 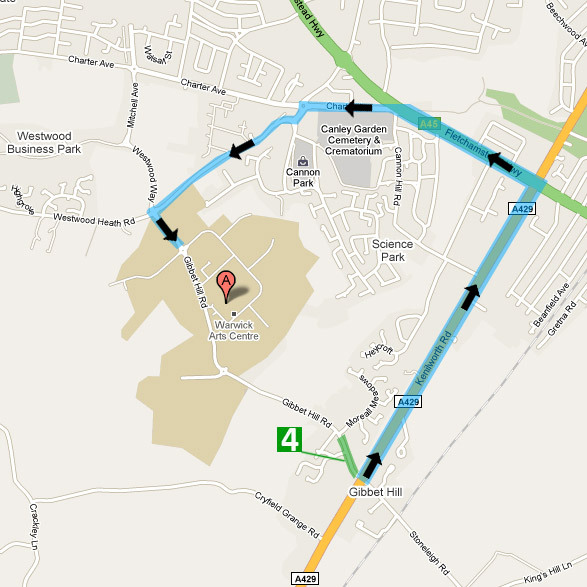 Parking is available and free of charge, please use the car parks numbered 15, 7 or 8a (signed conference parking). A ticket might be needed to enter through the barrier, but we will give you an exit code to leave the car park without having to pay. Please note that we are expecting roadworks to be ongoing during the summer school. This will limit campus access and traffic will be diverted via the Kirby Corner Road approach to main campus. This may cause some congestion during peak hours. Participants will be accommodated in student halls of residences using en-suite rooms (bedding, towels and toiletries provided). Upon arrival, you can check in for your room at the Rootes reception desks (building #51). You will receive a map and directions to your room location. Rooms should be available from 3pm onwards on the day of check-in. Check-out time is at 9:30am and the desks close at 11pm. You can return your key to the Rootes reception and a left-luggage facility will be available there to store your belongings. The reception desks can also be reached on 02476 52280 (7:00am-11:00pm). Your rooms are fitted with campus internet ports and spare ethernet cables can be obtained at the reception desks. Additional information is available in the official conference delegate flyer (PDF). A welcome reception will take place on Sunday evening, to be held in the atrium of University House (building #61) between 18:30 - 20:30. This will be an opportunity to register and meet the participants. After checking into your rooms at Rootes, follow University Road past the Sports Centre towards the multi-story carpark 15. Pick up the footpath from University Road towards University House. All meals are provided for, with breakfast, lunch and dinner served in Rootes restaurant on most days, except for the reception on Sunday and dinner on Wednesday evening when we will go off campus to the Coventry Guild Hall. The Rootes restaurant is a large self-service restaurant and the exact time you take your food is somewhat flexible with breakfast served from 7:30-9:30, lunch from 12:30-14:00 and dinner between 18:30-20:30. Your badge will let the restaurant staff know your meals are paid for. The Rootes building (#51) is opposite the Warwick Arts Centre (#63) and next to the Students' Union (#58) where a number of other cafe's, pubs and restaurants are located. The halls of residences, Rootes facilities and the Physics building are all a short walk from each other. In addition, there are cash machines, banks, a supermarket, chemists and a number of other retail outlets on campus should you need anything during the week. A Taxi rank and the main bus stop is also located close to the Rootes building. Regular bus services to Coventry, Kenilworth and Leamington Spa are available. As a conference delegate, you have free access to the Sports Centre, using your room key for access. Facilities include a swimming pool, gym, squash courts and outdoor tennis courts, so bring along your kit. If you do have remaining questions, ask us. We look forward to see you all on-campus in September.